Kajimoto, T. and Nakamura, S. (2018). 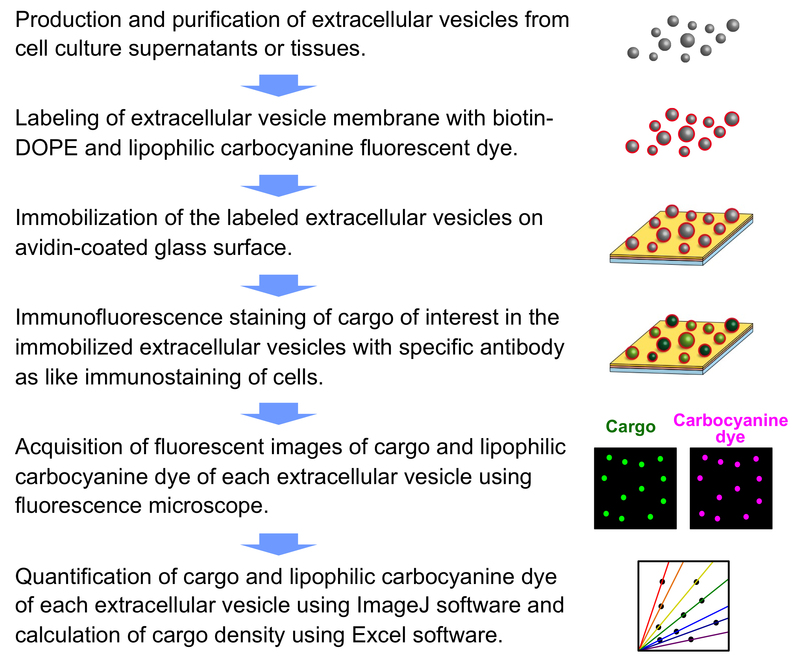 Quantitative Analysis of Cargo Density in Single-extracellular Vesicles by Imaging. Bio-protocol 8(24): e3111. DOI: 10.21769/BioProtoc.3111. Kajimoto, T., Mohamed, N. N. I., Badawy, S. M. M., Matovelo, S. A., Hirase, M., Nakamura, S., Yoshida, D., Okada, T., Ijuin, T. and Nakamura, S. I. (2018). Involvement of Gbetagamma subunits of Gi protein coupled with S1P receptor on multivesicular endosomes in F-actin formation and cargo sorting into exosomes. J Biol Chem 293(1): 245-253. Function of extracellular vesicles such as exosomes and microvesicles is determined by their wide ranges of cargoes inside them. Even in the pure exosomes or microvesicles the cargo contents are very heterogeneous. To understand this heterogeneous nature of extracellular vesicles, we need information of the vesicles, which will give us some parameters including vesicle size, number and cargo content of each vesicle. Here, we describe a new method to quantify cargo density in single-extracellular vesicles. Staining of extracellular vesicles in a membrane lipid content-proportionate manner and immobilization of extracellular vesicles onto glass substrate allow us to obtain cargo density information of single-extracellular vesicles. This protocol will be useful to analyze the effects of various drugs or genetic manipulation on vesicle generation and maturation including cargo sorting into heterogeneous extracellular vesicles. Extracellular vesicles are small membrane-bound vesicles released from a variety of cells, comprising exosomes and microvesicles based on the current knowledge of their biogenesis (van Niel et al., 2018). Extracellular vesicles contain various kinds of cargoes including cytosolic proteins, membrane proteins, lipids, microRNAs, and mRNAs. The cargoes are highly heterogeneous in their contents and variety depending on cell types. Extracellular vesicles play a role in erythrocyte maturation, antigen presentation, tumor metastasis, or prion disease and Alzheimer’s disease propagation, through cell-to-cell communication by carrying their cargoes from the donor to the recipient cells (Maas et al., 2017). Exosomes are formed by fusion of multivesicular endosomes (MVEs) with the plasma membranes. On the other hand, microvesicles are formed by shedding of the plasma membranes. Endosomal sorting complexes required for transport (ESCRT) is known to be critical for the generation of lysosomal MVEs. It is reported that ceramide is important for the generation of exosomal MVEs (Trajkovic et al., 2008). The size of exosomes ranges from 30 nm to 100 nm, whereas that of microvesicles is from 50 nm to 1,000 nm (Karpman et al., 2017; van Niel et al., 2018). The mechanism of cargo sorting into extracellular vesicles, especially microvesicles, is still mysterious. For understanding the heterogeneous nature of extracellular vesicles, it is important to get more information on cargo density as well as the number and the size of single extracellular vesicles. Conventionally, we can quantitate the amount of cargo in total extracellular vesicles obtained from culture media using western blot analysis. Since extracellular vesicles are highly heterogeneous as mentioned above, we need to get more precise figures of extracellular vesicles for the understanding of vesicle generation and maturation including the cargo sorting. We can solve this issue with detecting “cargo density of single-extracellular vesicles”. Here, we provide details on our new method for getting information of each extracellular vesicle with a cargo density. This protocol provides a useful readout of cargo content in each extracellular vesicle, and promote to unravel detailed molecular mechanism of the cargo sorting and accelerate clinical application of extracellular vesicles. Overall procedure for analyzing cargo density of single-extracellular vesicles is shown in Figure 1. HeLa cells or MDA-MB-231 cells are plated onto 35 mm culture dish or 6-well plate and maintained in Dulbecco’s modified Eagle medium (DMEM) containing 10% fetal bovine serum (FBS) and 1% penicillin/streptomycin (P/S) at 37 °C in 5% CO2. When cells are at 70% confluence, remove the medium and wash the cells 2 times each with 2 ml of 37 °C DMEM without FBS and P/S. Replace medium with 1.2 ml of 37 °C DMEM containing 10% extracellular vesicles-free fetal bovine serum and 1% P/S. Incubate at 37 °C in 5% CO2 for 24 to 48 h.
Note: In case of analyzing the exogenous cargo (e.g., GFP- or mCherry-fused protein), transient transfection needs to be carried out using lipid-based transfection reagent (e.g., FuGENE HD) 24 to 48 h before the replacement with the extracellular vesicles-free medium. Flowchart of this part is shown in Figure 2. Cell culture media (1.2 ml) from 90%-95% confluent cells is collected in 1.5 ml microcentrifuge tube. Centrifuge at 500 x g at 4 °C for 10 min to remove the cell debris using a refrigerated microcentrifuge. Collect all 1.2 ml supernatant and transfer to a new 1.5 ml microcentrifuge tube. Centrifuge at 12,000 x g at 4 °C for 20 min using a refrigerated microcentrifuge to separate microvesicles and others. Collect the upper 1 ml of supernatant is directly purified by filtration through a 0.22 μm pore filter and transfer into the ultracentrifuge thick wall polycarbonate tube. Approximately 70 µl of sample is lost after the filtration. The pellet from Step B2e is diluted in 200 μl of phosphate-buffered saline (PBS) (Microvesicle-enriched fraction). Ultracentrifuge the filtrated supernatant using ultracentrifuge (Optima TL, rotor: TLA-100.3) at 100,000 x g at 4 °C for 70 min. Remove supernatant (approximately 930 µl) carefully. 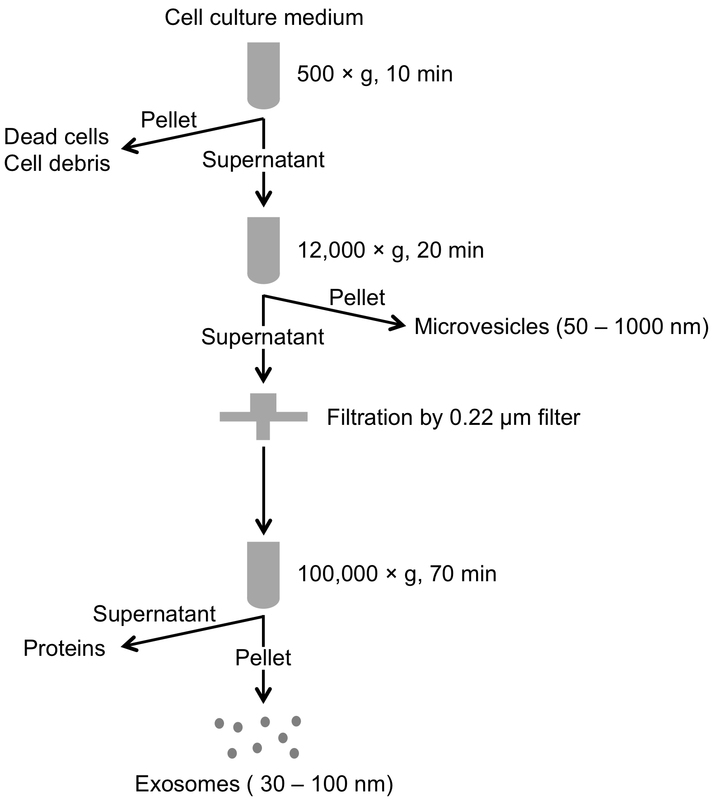 Dilute the pellet in 200 μl of PBS (Exosome-enriched fraction). Note: Alternatively exosomes can be purified using total exosome isolation reagent according to the manufacturer's instructions. Flowchart of this part is shown in Figure 3. Prepare BSA/BSA-biotin mixture with mixing 5 μl of 10 M BSA and 5 μl of 1 M BSA-biotin in 490 μl of PBS. Cover the glass surface of glass bottom 35 mm culture dish with 400 μl of the BSA/BSA-biotin mixture. Incubate at room temperature for 20-30 min. Prepare 25 mM streptavidin solution by diluting 8 μl of 1 M streptavidin in 312 μl of PBS. Remove excess BSA/BSA-biotin by gently rinsing the glass surface once with 1 ml of PBS. Cover the glass surface with 300 μl of the streptavidin solution. Gently rinse the BSA/BSA-biotin/streptavidin-coated glass surface twice each with 1 ml of PBS. Transfer the isolated extracellular vesicles (200 μl total) into a glass vial. Add 2 μl of 10 mg/ml DOPE-biotin into the glass vial and suspend to mix. Add 2 μl of 1 mg/ml DiD into the glass vial and suspend to mix. Note: Because DiD staining is the most critical step for calculating the cargo density, it is important to take exact amount of DiD. Spin down the glass vial in a 50 ml conical tube at 200 x g at room temperature and take it out with forceps. Then incubate at room temperature for 15 min in the dark (Figure 4). The DOPE-biotin- and DiD-labeled extracellular vesicles are applied onto the functionalized glass surface using gel loading long tip (Figure 5). Figure 5. Immobilization of extracellular vesicles on functionalized glass surface. DOPE-biotin- and DiD-labeled extracellular vesicle solution is applied onto functionalized glass surface and made it flat against the surface tension. Leave to stand at 4 °C for 2-3 h in dark condition. Rinse twice each with 2 ml of PBS. Note: In case of analyzing the transiently expressed exogenous cargo (e.g., GFP- or mCherry-fused protein), skip to “(G) Imaging” immediately. Fix immobilized extracellular vesicles with 4% PFA for 5 min in dark condition. Rinse extracellular vesicles twice with 2 ml of PBS and pipette out all solution. Add 150 μl of PBS containing 10% normal goat serum and incubate at room temperature for 30 min in dark condition. Rinse extracellular vesicles once with 2 ml of PBS and pipette out all solution. Add 150 μl of anti-cargo antibody (e.g., anti-cMet antibody) in PBS and incubate at room temperature for 60-90 min in dark condition. Rinse extracellular vesicles once with PBS and pipette out all solution. Add 150 μl of fluorescent-dye conjugated secondary antibody (e.g., Alexa 488 or Alexa 594) in PBS and incubate at room temperature for 30 min in dark condition. Rinse extracellular vesicles twice each with 2 ml of PBS. Store at 4 °C in dark condition, and observe in 2-3 days. Note: For this imaging part we will show about the exosome sample as a representative. Turn on the confocal laser scanning microscope (Zeiss, LSM 510 Meta). Open the Zeiss LSM510 v4.2 operating software. Turn on the appropriate laser (e.g., Argon laser for excitation of GFP or Alexa 488, 543 nm wavelength He-Ne laser for excitation of mCherry or Alexa 594, 633 nm wavelength He-Ne laser for excitation of DiD). Set the glass bottom 35 mm culture dish with immobilized and cargo-labeled extracellular vesicles on the specimen holder. Carefully find the glass surface using visible light under eyepiece viewing. Change the observation status to laser scanning. In the “Scan Control panel”, “Mode”, set the level of zoom to x1 (Default). In the “Scan Control panel”, “Channels”, set the pinhole to “200”. Adjust the focus with DiD channel using “Fast XY”. Collect averaged images (e.g., number is selected to 4 for the average) of DiD and fluorescent cargo (e.g., GFP- or mCherry-fused cargo or immunostained cargo with anti-mouse IgG Alexa 488 or anti-mouse IgG Alexa 594 as secondary antibody) and save them as lsm format. The acquired images of exosomes are shown in Figure 6 (in case of endogenous cargo) or in Kajimoto et al. (2013) or (2018) (in case of exogenous GFP- or mCherry-fused cargo). Figure 6. 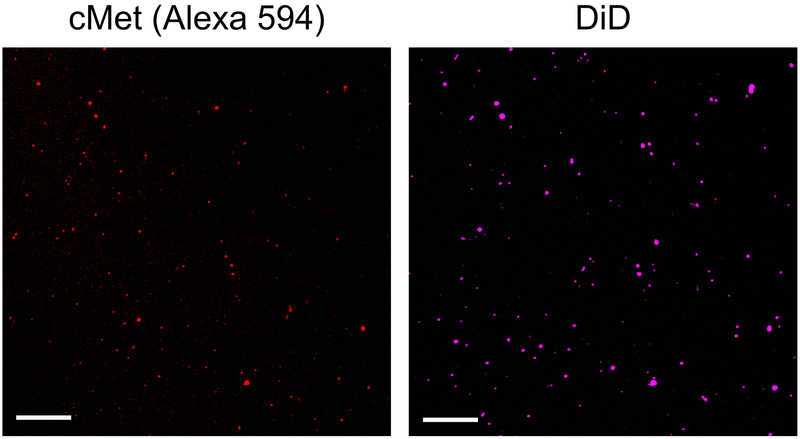 Fluorescent images of cargo (cMet-Alexa 594) and DiD in single-exosomes. Exosomes released from MDA-MB-231 cells are stained with anti-cMet antibody with Alexa 594 secondary antibody and DiD. Scale bars, 10 μm. Go to “Adjust” → “Set Measurements”, and check “Area”, “Mean gray value”, and “Integrated Density”, then click “Ok” button. 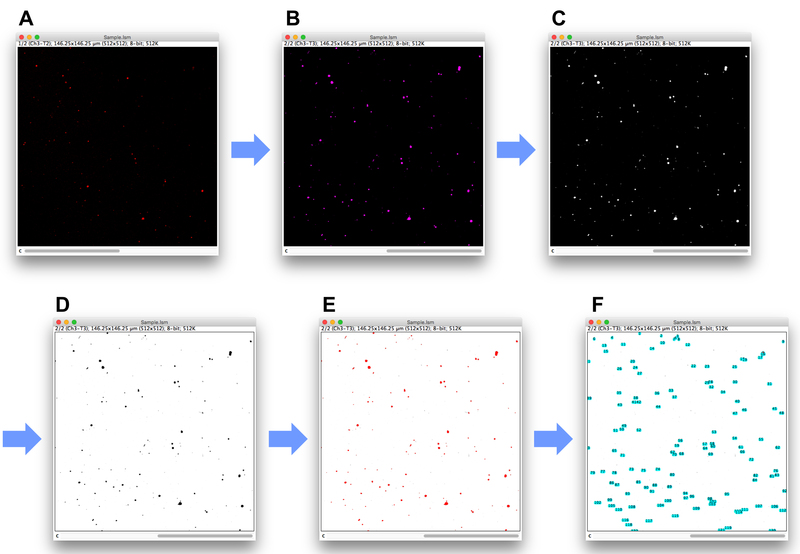 Open the acquired images (lsm format file, here using the data of Figure 6 as example) with drag-and-drop to ImageJ icon (Figure 7A). 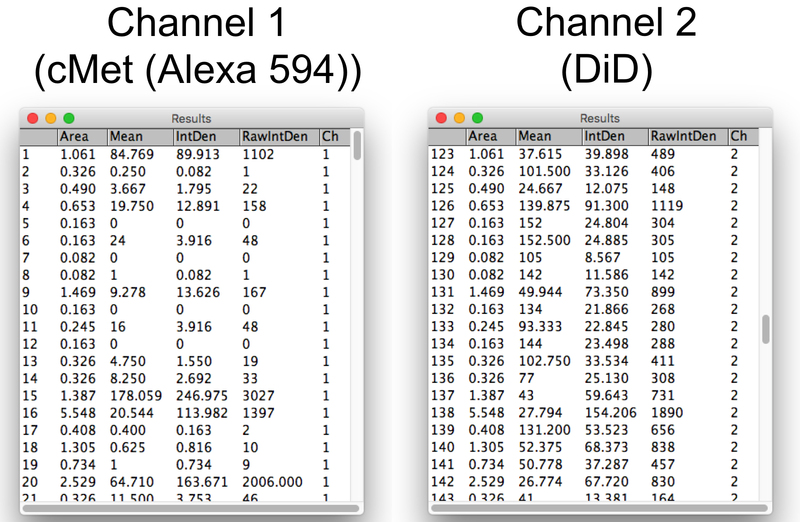 Select DiD image (Channel 2) (Figure 7B). Set “Image” → “Type” → “8-bit” and confirm that the image is converted to greyscale (Figure 7C). Set “Edit” → “Invert” → “No (against the question “Process all 3 images?”)” for inverting the image of DiD (Figure 7D). Use “Image” → “Adjust” → “Threshold” to highlight the extracellular vesicles (Figure 7E). Basically using “Auto” would be working well. If necessary, adjust the threshold to the suitable level to count. Go to “Analyze” → “Analyze Particles”. There are some options in the “Analyze Particles” window (Figure 7F). Basically use default setting (Size: 0-Infinity, Circularity: 0.00-1.00, Show: Nothing) and just check “Display results” and “Add to Manager”. If there are too many small noises or you want to exclude particles based on size, adjust the numbers of “Size”. In the “ROI Manager” window, go to “More” → “Multi Measure”, and just check “Measure All 2 Slices” and click “Ok” button. Get “Area”, “Mean gray value (Mean)”, and “Integrated Density (IntDen)” information of cargo (in channel 1) and DiD (in channel 2) of each extracellular vesicle (Figure 8). Figure 8. Results of “Area”, “Mean gray value (Mean)”, and “Integrated Density (IntDen)” of cargo (cMet-Alexa 594) and DiD in each exosome quantified by ImageJ. The total number of exosomes analyzed in this image is 122. Transfer the data sets to Excel by copy and paste. Obtain “Mean gray value (Mean)” information of background of cargo and DiD channels respectively. Open the acquired images again. Select vesicle-free dark area with “Rectangular” or “Oval” tool. Go to “Analyze” → “Measure”, and get “Area”, “Mean gray value (Mean)”, and “Integrated Density (IntDen)” information of both cargo and DiD channels. Transfer the data sets to Excel with copy and paste. Calculate background of cargo and DiD of each extracellular vesicle respectively. Note: If the calculating result becomes less than zero “0”, it would be fixed to zero “0”. This negative value means undetectable level of cargo or DiD. Calculate cargo density of each extracellular vesicle. Then make presentation diversely depending on the purpose of the study as in Kajimoto et al. (2013) or (2018). This protocol is applicable to all samples including adherent and non-adherent cells, plasma, and tissues. We used adherent cells as an example to describe the detailed protocol. The amount of extracellular vesicles varies in different cell types. In most cases, small-scale culture in 35 mm dishes or 6-well plates is enough, but in some cases, a large-scale culture in 60 mm or 100 mm dishes is required. If using the size- and density- dependent purification method for extracellular vesicles like differential centrifugation, it is important to use healthy cells for avoiding the contamination of apoptotic body or cell debris. Detailed conditions of Procedures C, D, and E are basically according to the previously reported fluorescence-based assay to measure single liposomes (Hatzakis et al., 2009). This protocol was adapted from procedures published in Kajimoto et al. (2013) and (2018). This work was supported by grants from the JSPS KAKENHI, the Uehara Memorial Foundation, the Osaka Medical Research Foundation, and the Nakatani Foundation. Hatzakis, N. S., Bhatia, V. K., Larsen, J., Madsen, K. L., Bolinger, P. Y., Kunding, A. H., Castillo, J., Gether, U., Hedegard, P. and Stamou, D. (2009). 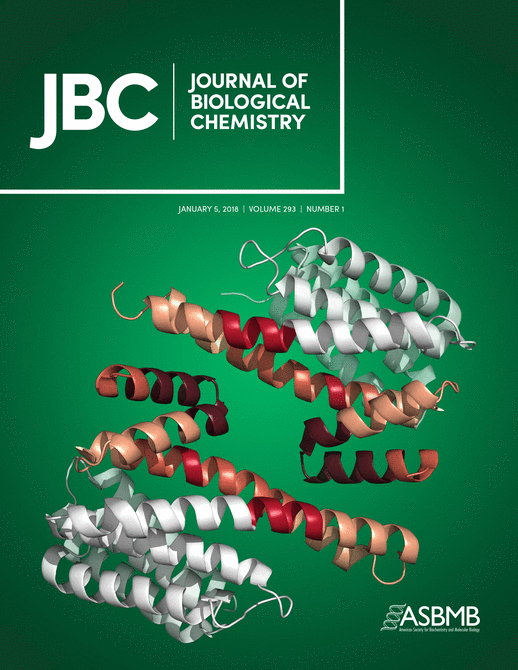 How curved membranes recruit amphipathic helices and protein anchoring motifs. Nat Chem Biol 5(11): 835-841. Kajimoto, T., Okada, T., Miya, S., Zhang, L. and Nakamura, S. (2013). Ongoing activation of sphingosine 1-phosphate receptors mediates maturation of exosomal multivesicular endosomes. Nat Commun 4: 2712. Kajimoto, T., Mohamed, N. N. I., Badawy, S. M. M., Matovelo, S. A., Hirase, M., Nakamura, S., Yoshida, D., Okada, T., Ijuin, T. and Nakamura, S. I. (2018). Involvement of Gβγ subunits of Gi protein coupled with S1P receptor on multivesicular endosomes in F-actin formation and cargo sorting into exosomes. J Biol Chem 293(1): 245-253. Karpman, D., Stahl, A. L. and Arvidsson, I. (2017). Extracellular vesicles in renal disease. Nat Rev Nephrol 13(9): 545-562. Maas, S. L. N., Breakefield, X. O. and Weaver, A. M. (2017). Extracellular vesicles: Unique intercellular delivery vehicles. Trends Cell Biol 27(3): 172-188. Trajkovic, K., Hsu, C., Chiantia, S., Rajendran, L., Wenzel, D., Wieland, F., Schwille, P., Brugger, B. and Simons, M. (2008). Ceramide triggers budding of exosome vesicles into multivesicular endosomes. Science 319(5867): 1244-1247.
van Niel, G., D'Angelo, G. and Raposo, G. (2018). Shedding light on the cell biology of extracellular vesicles. Nat Rev Mol Cell Biol 19(4): 213-228.